Returning to South America for a moment, I thought I’d post another pre-tango folk song, this time from gaucho country. 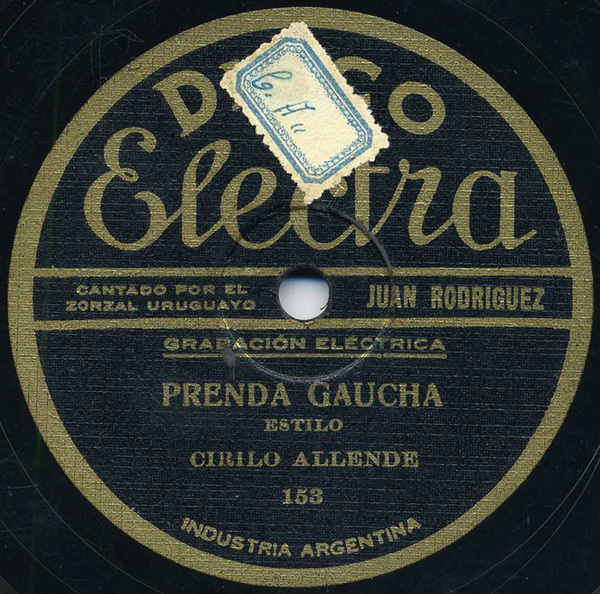 Little is known about Juan Rodríguez, except that he settled in Buenos Aires around 1920, and eventually became an artistic director for the fledgling Disco Electra label. According to the information I’ve been able to dig up (most of it from Omar Facelli in Montevideo), Rodríguez recorded approximately 25 records for Disco Electra, most of them stellar examples of criollo folk songs from the River Plate region, accompanied by guitars. He later recorded some for Columbia before passing away ca. 1935. This piece stems from ca. 1928, by my best guess. Disco Electra was, as far as I can tell, an early independent label out of Buenos Aires. Because Victor, Columbia, and Odeon essentially monopolized all the recording in the region, smaller outfits like Disco Electra probably had to work hard to compete. Despite the fact that the quality of their pressings can’t hold a candle to the major labels’, and that they were still recording acoustically until at least 1928-1929 (most companies worldwide had switched to microphone recording by 1926), important music was recorded on Disco Electra…and here’s but one example! A note: my bandwidth usage has skyrocketed this month, interestingly. While this heartens (and kind of amazes) me that so many people are downloading and listening to this lost music, I will have to (insert hangdog look here) keep a sharp eye on usage. In other words, I may have to resort to what every other blog does – keeping only the most recent tracks downloadable. I’ve kept this issue at bay by purchasing what I thought was a massive amount of bandwidth, but I may have to humbly ask your forgiveness in this arena. If you see early tracks disappear in the next week or so, don’t be surprised. Get ’em while you still can! I have recently found out about your stellar blog, and have been downloading lots of great gems. So far the Boateng, Conjunto and Cheikha are my favorites. I understand that you have had some issues with bandwidth. I love that you are able to make these tunes avaialble to download by right-clicking and saving to a folder. However, have you considered using Sharebee or Massmirror for the files that had to be deleted. I missed out on these earlier posts and would love a chance to hear the songs. Let me know if there’s anyway I can listen to these rare tunes. Glad you’ve found the site and are enjoying the sounds! This is important to me. Regarding the earlier tracks. Most may reappear in the future under a different guise – a very cool one. So, hang tight. Some will most likely not reappear as there’s the possibility they will see legitimate re-release. Of that I can say nothing – something may happen, something may not. As for the sharing sites, for now I prefer to use something like FileDen, because it gives me at least the illusion of control over the material from my collection. Rather than have the songs on a sharing site such as those you mention, I can tell how much material is being downloaded, by how many people, etc. Most of the material on this site is not available on the web, anywhere, by anyone…it’s at least a mildly effective way to keep tabs. That said, I’m always interested in better solutions. Ultimately, I guess I should just get my own webspace, for crying out loud!